Violin & Horn Tapestry Cushion is rated 4.19 out of 5 based on 8 ratings. A real beauty! 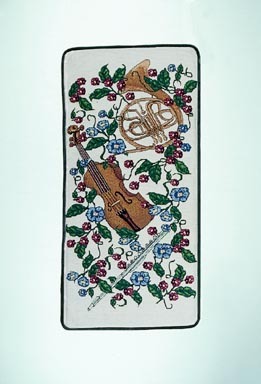 Flute, violin and french horn intertwined with blossoming vines on a light beige background. This 1" thick tapestry cushion comes in your choice of 10 colors for the back and ties. Choose 1", 2" or 3" thick for some customized luxury! Custom made to your order in our USA workshop. Due to nature of tapestry pattern this cushion available only in one standard size - 14"x30".